(A) Four Flag-tagged DUBs (USP3, USP9X, USP22, and OTUD1) were expressed in HEK293T cells, and cell lysates were analyzed by IP with Flag beads followed by IB with antibodies against ALDH1A3 and Flag. 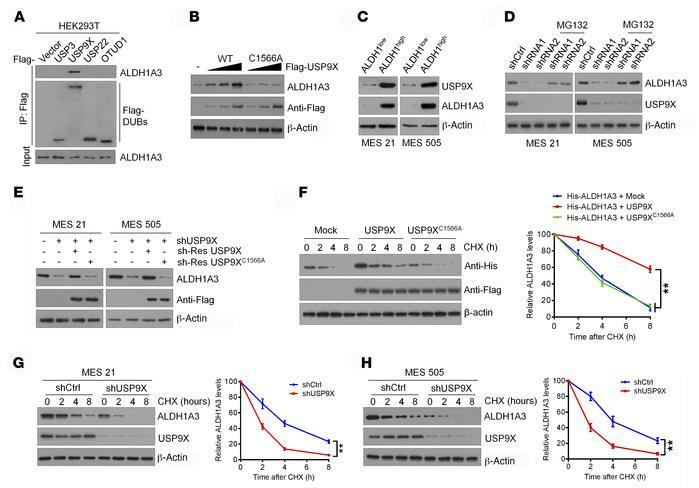 (B) Increasing amounts of Flag-tagged USP9X (WT or C1566A mutant) were transfected into HEK293T cells, and cell lysates were analyzed by IB with antibody against ALDH1A3. (C) IB analysis of USP9X protein expression in ALDH1hi and ALDH1lo subpopulations isolated from MES 21 and 505 GSCs. (D) MES 21 and 505 GSCs transfected with 2 independent USP9X shRNA were treated with or without the proteasome inhibitor MG132 (20 μM, 8 hours), and then USP9X and ALDH1A3 were analyzed. (E) IB analysis of ALDH1A3 levels in MES 21 and 505 GSCs transduced with USP9X shRNA, together with either shRNA-resistant (sh-res) Flag-tagged USP9X WT or USP9X C1566A. (F) HEK293T cells were cotransfected with His-tagged ALDH1A3 and Flag-tagged USP9X WT or USP9X C1566A, treated with 100 μg/ml CHX, collected at the indicated times, and then subjected to IB with antibodies against His and Flag. Quantification of ALDH1A3 levels relative to β-actin is shown. (G and H) MES 21 (G) and 505 (H) GSCs stably expressing control shRNA or USP9X shRNA were treated with 100 μg/ml CHX, harvested at the indicated times, and then subjected to IB with antibodies against ALDH1A3 and USP9X. Quantification of ALDH1A3 levels relative to β-actin is shown. Data are represented as mean ± SD of 3 independent experiments. **P < 0.01, 1-way ANOVA with Dunnett’s post test (F); 2-tailed Student’s t test (G and H).